On April 7, 2017, the little blue friends that we adore are returning to the big screen in Smurfs: The Lost Village. We know kids are going to love this film, which means lots of upcoming requests for Smurfs themed parties. 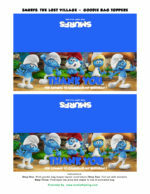 Here is the perfect Smurfs party idea to help you plan an awesome party. We created quick and easy Smurferrific Cupcakes for you to make and included printable cupcake wrappers and toppers for an added touch. Prepare cupcakes by following the instructions on the box. Add 1 1/2 cup of blueberries to your mix and stir in. Cook for the amount of time listed on the box. Using red frosting, spread on top of the cupcakes. Add white sixlets to the top. Decorate using the below cupcake wrappers and toppers. For those of you who want something a bit fancier, here are a few more Smurfs The Lost Village Party Recipes brought to you by Sony Picture Animation. I can’t wait to see this movie. All of the recipes look easily enough to make.